Ms. Sawyer has written a coming of age story that is believable, enjoyable and a delight to read. I read it in less than a day. The story flows from one chapter to the next and I didn’t want to put it down. A marvelous tale of faith, courage and determination. Set before the outbreak of World War I, Elisabet Conley, Peter Leidig and Bennett Martin are all orphans, raised together but never finding homes of their own. Heading off to college together on scholarships, the friends must face many obstacles in their chosen paths. Elisabet (Libby) wants to be a serious journalist in a time when women were relegated to the gossip columns or homemaking pages. While investigating a story, she makes a terrible discovery about Peter’s family. Peter, abandoned by his family at age 7, holds so much anger towards his parents. At the age of 10 an accident claimed one of his legs and he blames them for turning him onto the street to fend for himself. He found acceptance and love at the orphanage but still cannot find it in his heart to forgive them. Strangely enough, he wants to become a minister and will have his faith tested by the revelations Libby has uncovered. Bennett never knew his parents, he was abandoned as a baby on the orphanage doorsteps with only a note giving his name and birth date. He feels as if he’s never belonged anywhere and never measured up to Libby and Peter. He wants to join a fraternity at the college to try to capture that feeling of being wanted for who he is. As he struggles to find his place, he must face the resentment he feels for those he thinks of as his friends. Touching, uplifting and, at times, exciting, Libby’s story is one of faith and an intense desire to find her way. As a child, she asked the woman she desperately wants to adopt her, “Why do you wait for him to come home, why don’t you pick someone else to love.” The woman responds, “Because you cannot miss the one you love when they are away from you. 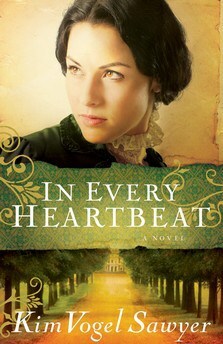 I feel him in every heartbeat.” Libby has to go through much to discover this truth for herself.